The award winning Series 3 is the larger three head version of the series 1. Locally manufactured from the same premium grade materials with many design features normally only found in higher end surgical lights. Multiple mounting configurations and a choice of lamp options are offered in this comprehensive and high quality range. With minimal heat output and high colour rendering the Series 3 is the perfect choice for nearly all applications in the hospital or physician’s office. 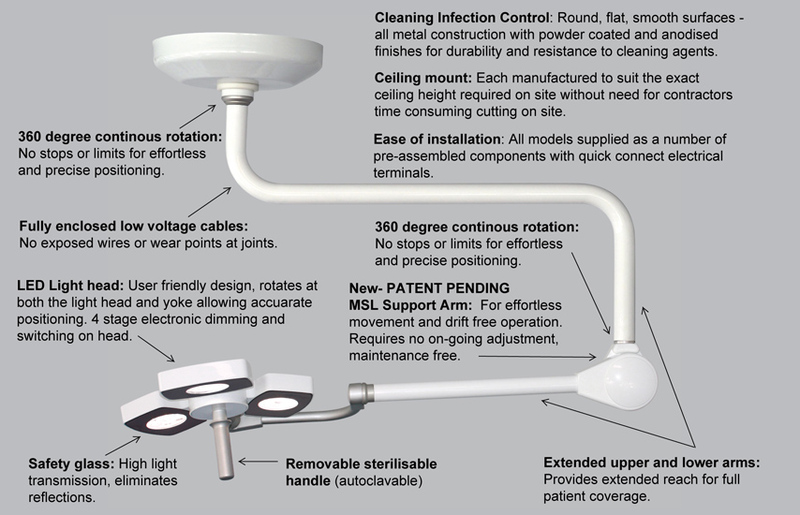 The award winning Series 3 ceiling offers continuous 360° rotation around the upper ceiling joint, providing maximum reach and range of movement for full patient coverage. The Series 3 wall mount offers exceptional flexibility in areas where a ceiling mounted light might not be possible.